C++âs Standard Template Library is revolutionary, but learning to use it well has always been a challenge. Until now. In this book, best-selling author Scott Meyers ( Effective C++ , and More Effective C++ ) reveals the critical rules of thumb employed by the experts â the things they almost always do or almost always avoid doing â to get the most out of the library. Other books describe whatâs in the STL. Effective STL shows you how to use it. Each of the bookâs 50 guidelines is backed by Meyersâ legendary analysis and incisive examples, so youâll learn not only what to do, but also when to do it â and why. Like Meyersâ previous books, Effective STL is filled with proven wisdom that comes only from experience. 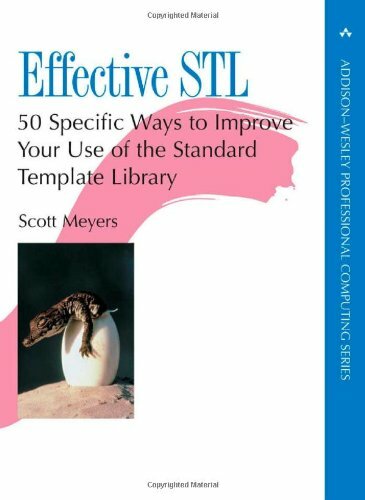 Its clear, concise, penetrating style makes it an essential resource for every STL programmer. About: “This is Effective C++ volume three – it’s really that good.